In a year that's seen this new technology head into the stratosphere, choosing the best wearable of the year is a near impossible task. However, that's the task that's been undertaken by the Wareable team, and we've each picked our favourite device of the year. 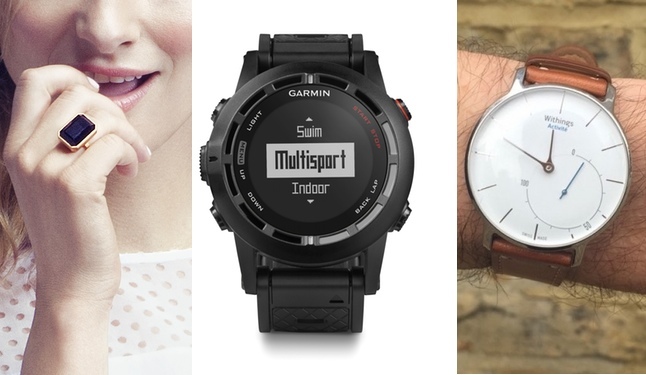 So which got our coveted vote for the best wearable tech gadget of the year? Read on to find out. I've taken this category name literally and gone for the wearable that I think is the most, well, wearable. Both the Moto 360 and the LG G Watch R are both fine looking watches - but with a massive caveat: they are fine looking watches for Android Wear devices. And we need to arrive at a time where no caveat is necessary. We need to be talking about wearable tech that is genuinely wearable - devices that you feel proud to wear. And, in 2014, there was only one device that did that for me - the gorgeous, elegant Withings Activité. There are a huge number of devices that deserve mentions for the best of 2014. While I doff my wearable cap at the Jawbone UP Move and Misfit Flash – both of which have shown that basic fitness tracking shouldn’t cost over £50. However, it’s a sports watch that grabbed me this year. Training for the Amsterdam marathon made me fall in love with the Garmin Fenix 2. It’s the ultimate action-man watch, capable of tracking runs, trail runs, cycling and even indoor gym stuff. The Garmin Connect software is superb and the 50 hours of GPS tracking means it has way more energy than you do. It’s been a year of exciting but not-ready-yet wearables. Not ready yet like the game-changing VR headset Oculus Rift which should go on sale properly next year. Not ready yet like the impressive but unreliable Moto Hint - if you’re interested, wait for version two. I’m going to go a bit left-field and choose Ringly. This ring that buzzes or changes colours to show notifications is simple, stylish and the precise opposite of a gadget on a strap. OK, OK it hasn’t shipped yet. But if a device like Ringly really delivers, it could be one of the first truly inconspicuous wearables and that’s the future. A device that simply doesn't compromise, the Withings Activité is a fully featured activity tracker and an all-round beautiful Swiss-made watch. The Withings ecosystem is one of the best in the business, and the Activité is quite simply the finest looking wearable device on the market. The bar has been set high for 2015.